As promised before, Jurgan brought my attention to a charming pair of letters. But let me tell you the whole story, because it is pretty great from beginning to end. Sainsbury’s is a very big grocery store chain in the United Kingdom. And for years, they’ve sold the bread we know as Dutch Crunch under the brand name Tiger Bread. You can see why. Some tigers do have that kind of fur coloring. Obviously that isn’t typical. Tigers tend to have stripes. Maybe it’s more like a Liger. But three and a half year old Lily Robinson had other ideas. 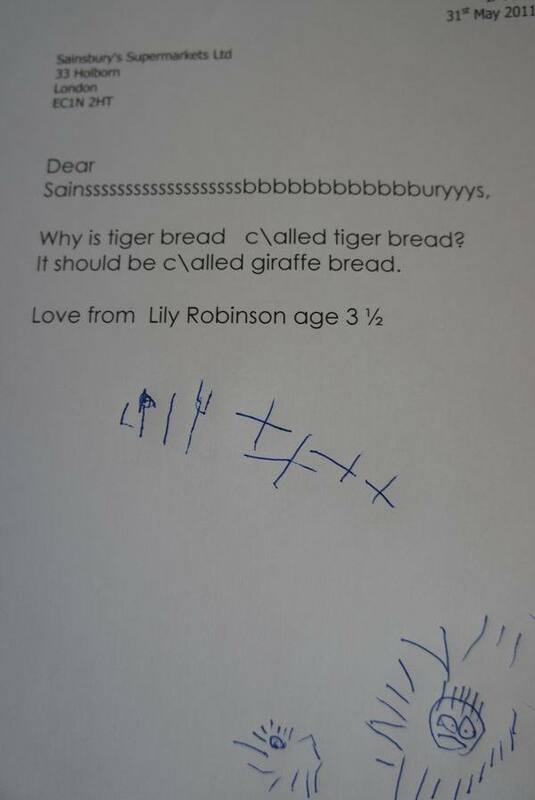 On 31 May 2011, she wrote to Sainbury’s asking why they called their Dutch Crunch “Tiger Bread” when it clearly looked more like a giraffe and thus should be called Giraffe Bread. In response to overwhelming customer feedback that our tiger bread has more resemblance to a giraffe, from today we will be changing our tiger bread to giraffe bread and seeing how that goes. As far as I know, the grocery store is still selling it under the name Giraffe Bread. 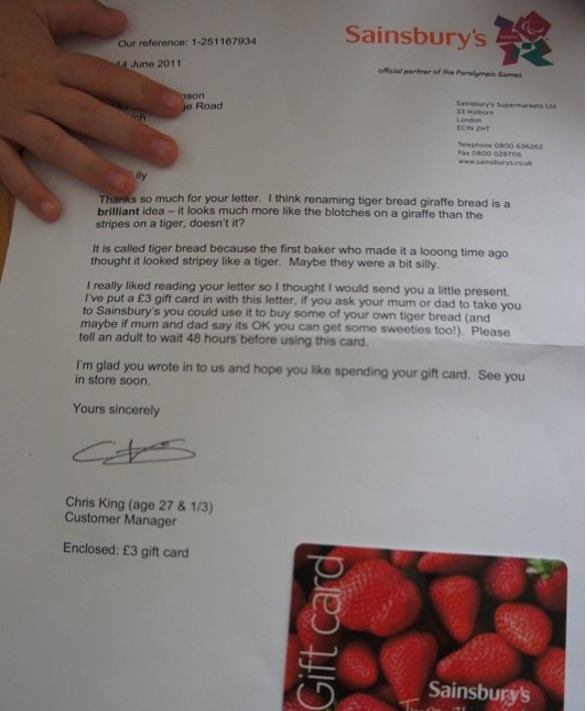 As a nice postscript to the story, Chris King quit his job at Sainbury’s to go back to college to become a primary school teacher. I think he has the perfect temperament for it. I do not like Dutch Crunch under any name at all. The crust is nice enough. But inside is a doughy tasteless white bread. I’m surprised that it is as popular as it is. There are so many better breads around. According to that BBC article I linked to above, “Rice paste is brushed on to the surface before baking, forming the pattern as it dries and cracks while it bakes.” That means you could put that crust on an actually good bread. But as you can see in the image above, Giraffe Bread only costs £0.75 — making it a very cheap bread. But it seems to me it is much more expensive here in the states. All images were created by me based upon original images used under fair use. Was this the first you heard about it? Always so surprising what blows over the internet when people are bored on holidays. Oh yeah. It would destroy my self-image if I knew about things while they were happening. But I figure I can write about them because even the most viral stuff is only seen by 10 or 20 million people. And five years later, they don’t much remember it. And in this case, I suspect a lot of people who say the first letter never heard that the the store changed the name. But I know there will always be people who think I’m way behind the times. But that’s where I belong! I have too much free time and spend a great deal of it in stupid websites like Buzzfeed, Cracked and Facebook so I see these sort of things. And there is no harm in writing about cultural phenomenon long after it wanders around, someone has to keep the memory alive. Well, this one was just too charming. On the other hand, I just looked at 38 pictures that went viral. I’m thinking of writing an article about it because it was so stupid. It does seem that the internet is most interested in things that 10 year old boys find titillating. Of the 38 only one was a truly compelling optical illusion. Many of them were just: oh look: a fat guy. But the story of tiger bread is one that ought to be shared. Yes, yes it is because the mentality of the people looking at those viral images is about 10 years old and male. Unless you are on Pininterest or something I think. Then again, thanks to people like George Takei, there are some nice things out there. Yeah, even if he can’t spell Matthew Shepard’s name correctly. I will have to check out Pininterest. Hopefully someone will pay me to do it.